I’ve been known to say that all work and no play makes Jill a very dull girl, and I am trying to spend more time playing in the studio with things that make me happy. Isn’t that why we have these hobbies after all? I was eager for color and I wanted to play with some new silkscreens that I have. So…I played around with the Opulent Tapestry project. When I was in the UK earlier this year, I picked up an array of new silkscreens to try. They’re from Małgorzata Wawrzynczak, who makes them under the name of Moiko Silkscreens. I was blown away by the crisp perfection of the designs and with the ease of using them. You can get them at Clayaround in the UK, by the way, and there is a Moiko Silkscreen Etsy shop shipping worldwide. They’re just a step above all the others, in my opinion. I was very impressed! Even though these are all mandala shaped, the Moiko screens come in all sorts of designs. But they’re all crisp like this, and many of them have matching left/right designs so that you can make earrings without having to flip the screen. I was also sent an array of silkscreens by Ilysa and Kira from Create Along. The designs are more “distressed” by nature, but there are a lot of neat large-scale designs if you need to cover large areas. They also have many designs that are really perfect for this Opulent Tapestry style, with lots of henna-inspired bohemian types of designs. Many thanks to Ilysa and Kira for sending them to me to try! I used silkscreens from Create Along to make the designs on these Opulent Tapestry jewelry pieces. These silkscreens have larger designs, perfect for making a large veneer sheet so you can make coordinated pieces. Because I wanted to try out these silkscreens, and because I was really eager for some experimentation and color-play fun, I sat down for a session of making things with my Opulent Tapestry Tutorial. I hadn’t played with these since I wrote the tutorial back in November, and I was really happy to find they’re still just as fun. Series? Serieses? (I think the plural of series is still series.) Anyway, you might notice that I’ve changed the cover of the Opulent Tapestry Tutorial to reflect that it’s part of a Project Series. I’ve separated out my various tutorials into three series (Technique Series, Project Series, and Knowledge Series) to make it more clear what sort of information is included in the tutorial or eBook. I’ll be adding the graphics to each tutorial as I get time. Bit by bit. I’m trying to learn that you can’t do it all in one day. And you have to take time to play. Here’s more eye candy from my play day. These Opulent Tapestry pendants really keyed into my favorite colors as of late. The silkscreen in the middle is from the Sculpey Silkscreen kit and the two on the ends are Moiko Silkscreens. I really love this one, and I’m going to string it with an opulent ribbon of some sort (yay…ribbon shopping!) in matching colors. The base colors were deep and lovely blues and browns and the silkscreen is one of the Moiko screens. Look at that detail! Here’s another Moiko screen, and notice that I used Premo “white gold glitter” clay to get that really cool sparkle in there. I love these so much I want to make 10 of them and make a mobile. That would be SO cool. I like that these Opulent Tapestry pieces give me an opportunity to use up various beads that I’ve carried around for years (decades?) These designs used silkscreens from the Sculpey Silkscreen Kit. Love Working with Silkscreens on Polymer Clay? Do you love working with silkscreens on polymer clay but haven’t had good results? Or maybe you’re interested in getting started but don’t know exactly what’s involved? That’s why I wrote the All About Silkscreens eBook. It’s designed to show you about these various types of silkscreens, to teach you how to use them in the traditional ways and with other types of media. And the eBook gives lots of tips for dealing with runny paint, troubleshooting, and of course, how to get the best silkscreen prints on your polymer clay. It’s been a very popular eBook and makes an excellent companion to the Opulent Tapestry Tutorial. Disclaimer: I received the Create Along and Sculpey Silkscreens as gift samples, but I purchased the Moiko screens myself. I gave them all the same honest consideration. I keep saying…bribe me with liquorice toffees and I might write a biased review, but short of that…this is just the facts as I see them. I’ve seen mention of the Moiko silkscreens on Spanish clayers’ blogs and wondered about them. Thank you for providing an international supply source. Yes, and I was thrilled to see even more cool designs on her Etsy shop. So cool. Ginger , your time in the studio was well spent all your projects are beautiful, and the blue pendent is indeed stunning. 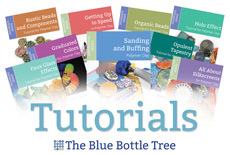 If anyone out there is sitting on the fence about trying a tutorial from the Blue Bottle Tree, run to your nearest computer and sign up. Her tutorials are well thought out, full of photos, and step by step directions. Its the next best thing to being in a classroom of one on one. Thank you Jennifer, what a lovely thing to say. I’m so glad that you enjoy my tutorials. I do put a lot of care into them! wait.. what are liquorice toffees? That sounds like a combination made in heaven. Is this something we can get stateside? Or is that one of those tasty items only found abroad? Oh, you are in for a treat. If you like black licorice, but can’t stand the molasses taste of twizzlers and the like…do seek out some Liquorice Toffees. They’re found in some stores in England. You can buy them online, too. They are rather similar to hard, chewy caramel, but intensely creamy licoricey. No molasses. Pure heaven. I always buy bags and bags when i go over and then savor them, trying to make them last until my next trip. This is completely off the subject, how is your sick kitty? I do hope all is well! Aw, thanks for asking. Getzger (he’s a nearly 14 year old Abyssinian) had three teeth removed on Monday, so he now has little tiny stitches in his mouth and shaved arms from his IV’s. He also has kidney disease and severe arthritis, so he had to have extra TLC during the procedure. He’s past the loopy stage and is back to being his annoying self. He spends much of his day convincing me that it is, indeed, food time. Or at least water time. Or even time to go out to get the mail. He lives for that!